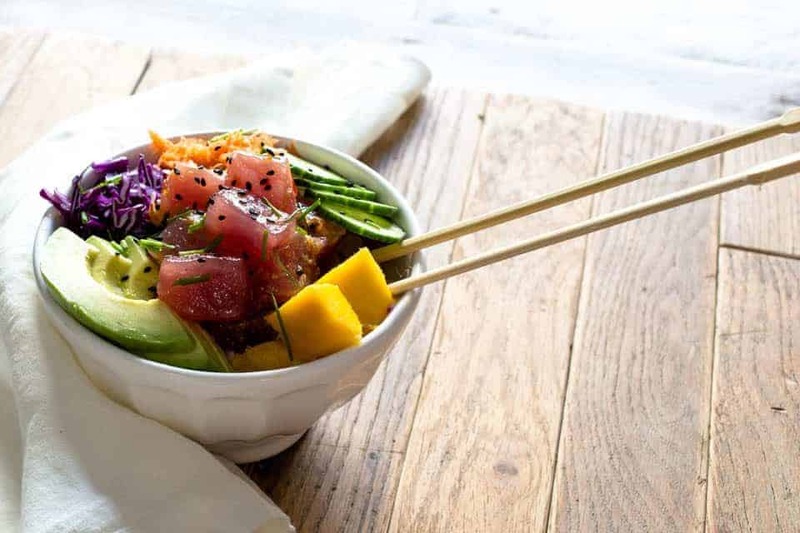 I have been looking forward to posting this Whole30 paleo poke bowl recipe for a very long time now. They are quick and easy to whip up and come with all of the fresh and nutritious toppings. Gluten free, paleo and Whole30 compliant! Wait a second. I am having an epiphany… what if you were to dip some of my baked plantain chips into this Whole30 paleo poke bowl? You could leave the rice out and just snack on the poke with the plantain chips. Do I finally have you drooling with me? I sure hope so. I put a lot of love into this recipe. My main goal though, was to allow for you to get as creative as possible with the toppings. I recommend following the poke marinade recipe to a T, but you can really top off these poke bowls with whatever you’d like! I am super duper excited for this upcoming weekend. My husband requested this upcoming Sunday off work by accident and forgot to cancel his request– and thank goodness! We decided to plan an impromptu trip up through Big Sur into San Luis Obispo, Santa Cruz and San Francisco. I am hoping we can hit Napa or Sonoma and do a day of bike riding and wine tasting as well. We will be staying with my friend Simone over at Zenbelly who is the ultimate gluten free/paleo caterer! Moving right along, back to poke bowls land… ! I decided to top off my poke bowls with red cabbage, shredded carrots, sliced avocado, cubed mango and cucumber slices! Then, I sprinkled some fresh chives and black sesames all over and called it a day. I was so ready to get down with my poke bowls. Has anyone else ever had to place a splash guard over a recipe they were photographing? To prevent the drool from getting everywhere? That was real life for me while photographing this recipe. Don’t laugh, it wasn’t easy. My favorite part about eating poke bowls is how filling they are. You can create a nice, mountain top of white rice or cauliflower rice (check out a yummy recipe for cauliflower rice right here). Add as much tuna as you’d like and be as heavy handed or as light handed as you’d like with the toppings. 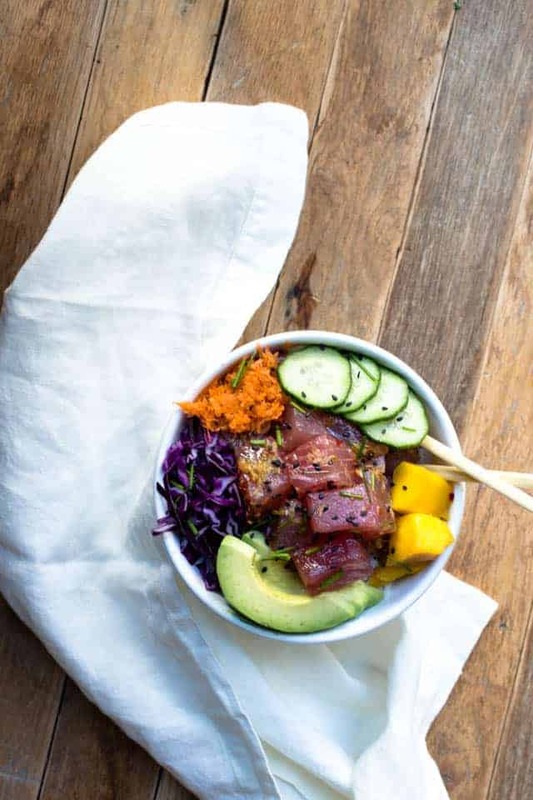 These Whole30 paleo poke bowls can be a main meal or a snack, depending on what you want! Awesome, huh? Okay, so without too much more rambling, I’ll go ahead and tease you with a few more photos before you find the recipe below! I’m the worst. Recipe adapted from Half Baked Harvest! For a Whole30 compliant chili garlic paste, check out this recipe here! Otherwise, you can buy chili garlic paste at most Asian markets! In a large bowl, combine all of the ingredients except the tuna. Whisk the sauce well to combine. Add the tuna and toss well. The tuna can sit in the dressing for a half a day or so, but if you leave it any longer the acid in the citrus will begin to slowly cook the fish (Thank you Teagan at Half Baked Harvest!) Keep the fish cold at all times! To assemble the bowls, add rice to each bowl and top each bowl with the desired amount of tuna and toppings. Garnish with fresh chopped chives and extra toasted sesame seeds. Top off with a little extra sauce! This looks amazing!! Thanks so much for linking up to my chili garlic sauce!! This is making me soooo hungry. 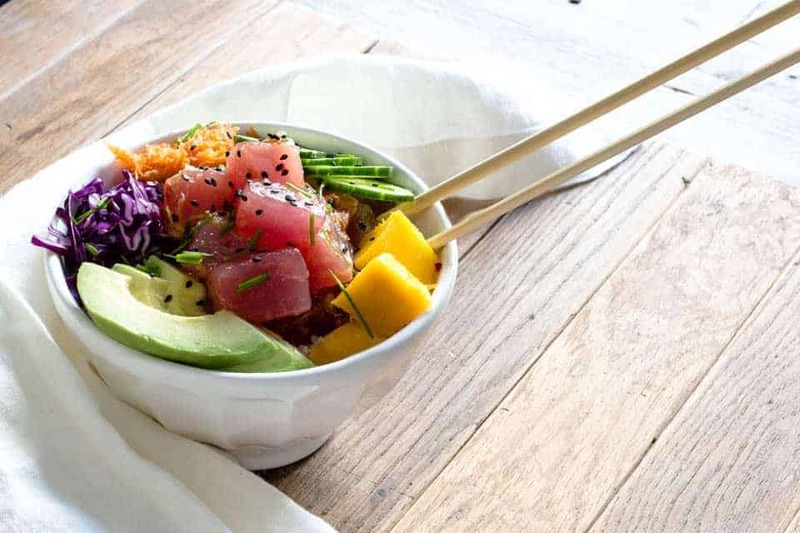 I’ve been on such a big poke bowl kick when out, but have yet to make at home and think I need to ASAP since it’s kind of all I’ve been craving lately. This looks delicious, I can’t wait to try! Hi there! Do you mix the mango, carrot, etc. in with the sauce before you add the tuna…or are those parts added after?